We know it as the chikoo. We love it as it is, in fruit salads and in milkshakes, without realising how healthy this fruit, which has the scientific name of Manilkara zapota, is. The sapodilla is native to Mexico, Central America and the Caribbean and grows abundantly in India among other tropical countries. The strong, long-lived tree can grow to a maximum height of up to 100 feet. 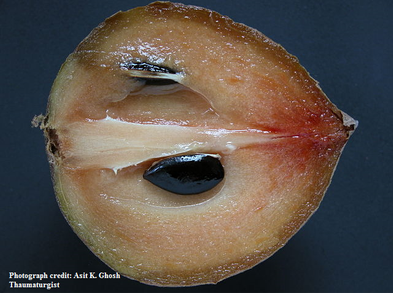 Depending on the type of sapodilla, the fruit or berry can be round, oval or conical. The flesh is soft, juicy and sweet and in a range of shades of brown, again depending on the variety. The berry has black or brown seeds that are oval in shape. It is rich in vitamin A and therefore is good for vision. The fruit’s high fibre content make it a good remedy for constipation and indigestion. The high antioxidant and fibre levels in the chikoo help prevent the occurrence of cancer of the colon, lungs and oral cavity. The anti-inflammatory property of chikoo provides relief from haemorrhoids. The leaves boiled in water also provide an anti-inflammatory decoction. It is excellent for hair and skin health. It is a natural sedative which makes it useful in anxiety and depressive disorders. Sapodilla has antibacterial properties which allow it to battle coughs and colds, and it acts as a decongestant. It is a diuretic which stops water retention. It regulates blood pressure and blood circulation. It is a perfect fruit for pregnant women with its high nutrient quntity, especially vitamin B and folic acid. The calcium, phosphorous and iron in the fruit give you strong bones. Ingredients: 1 kg Basa fish, 1 tsp of mixed herbs, 300 gm of tomato puree, 2 tbsp of wheat flour, two medium sized carrots, 75 gm of corn, 75 gm of peas (fresh or frozen), 100 gm of French beans, 100 gm of cauliflower florets, 1 medium sized onion, 350-400 gm of potatoes, 100 gm of cheese spread/ grated cheddar cheese, 50 ml of milk, 2 tbsp of oil, two rashers of bacon and salt. Preparation: Cut the fish into medium sized pieces and mix it with the wheat flour, mixed herbs and ¼ a tsp of salt. Lightly fry the chopped onion till it is translucent and add the fish. Add the tomato puree and allow to cook for 10 minutes on a low flame. Meanwhile set the oven to 200º C, and boil the vegetables together with a bit of salt (15 minutes). Peel, quarter and boil the potatoes separately with a pinch of salt for about 25 minutes on medium heat. Drain and mash the potatoes with the cheese and milk. Layer an oven proof dish alternately with vegetables and fish preparation. Crisp the rashers of bacon, cut them into small pieces and add to the layers. Cover the top with the mashed potatoes. Bake at 150º C for 25 minutes. When done, sprinkle some grated cheese on the top and return to oven on high heat for a 2-3 minutes and then serve. You can add prawns and decrease the amount of fish for a different flavour. Make a mixture of a teaspoon each of mint juice, lime juice and honey. Take this three times a day for relief. Adding a teaspoon of apple cider vinegar to a glass of water and having it twice a day will ease a troubled stomach. Boil a ½ inch piece of ginger in a glass of water and have it will a teaspoon of honey to reduce stomach cramps and loose motions.